As everyone knows, cats like to go outside during the spring, fall and summer months when they see flowers blooming, birds flying and bees buzzing. However, there are many problems letting your babies outside to enjoy this phenomena because they might get lost, run over by a car or become prey for a hawk. So what is the solution to this problem. The perfect solution is to give them a cat window perch so they can view the greater outdoors. 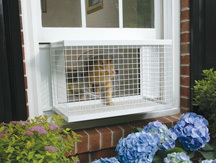 There are comfortable perches that fit on the window or the Cat Veranda that allows the cat to sit outdoors. Either way your cat view outside or just sleep on the comfortable perches. This will create an ideal paradise for your cat. If you have more than one cat, you’ll will probably have to have several purchase at different locations in your house. All the same, you’ll be giving you cat an adorable sweet little home.